[miningmx.com] – EDGAR Lungu, the newly elected president of Zambia, has been diagnosed with a rare disease that constricts the food pipe, said Bloomberg News which added that Lungu had collapsed after standing at a ceremony for 20 minutes. “The sudden illness of yet another Zambian head of state – coming as it does on the back of market uncertainties, mining debates and potential upheavals at the central bank while the currency slides – is bound to create jitters and cause some concern,’ Gary van Staden, a political analyst at NKC Independent Economists, said in an e-mailed note to clients cited by Bloomberg News. 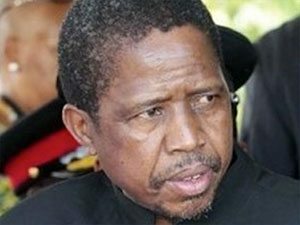 Lungu, who won a tightly contested national election in January following the death in October 2014 of former president Michael Sata, has promised to review legislation that has increased royalties for open cast and underground mining.